Lin Gaoyuan and Chen Meng won the respective men’s singles and women’s singles titles at the Seamaster 2019 ITTF World Tour Hungarian Open in Budapest on Sunday 20th January. It was a day when once again Chinese players demonstrated their undoubted skills. Success for Lin Gaoyuan and Chen Meng but it was an outcome not necessarily as predicted; most notably both men’s singles semi-finals produced upsets. …………Required to compete in the qualification tournament, 18 year old Wang Chuqin beat Fan Zhendong (7-11, 11-7, 13-11, 5-11, 12-10, 3-11, 11-9) at the semi-final stage of the men’s singles event and thus reversed the decision of one year ago when they met in the final. …………In the men’s singles penultimate round, Lin Gaoyuan, the no.3 seed, accounted for Xu Xin, the no.2 seed (14-12, 11-9, 11-6, 11-9) and thus repeated his success of just over one month earlier at the quarter-final stage in Incheon at the Seamaster 2018 ITTF World Tour Grand Finals. 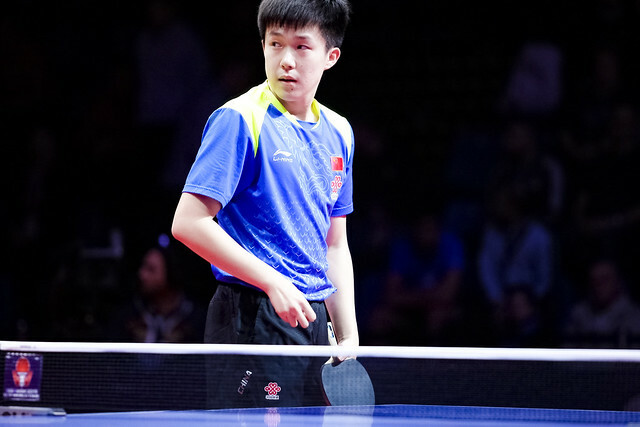 …………Wins for Lin Gaoyuan and Wang Chuqin meant that for the first time since Portugal’s Marcos Freitas beat Germany’s Patrick Baum in 2014 in the Czech Republic, two left handers contested an ITTF World Tour men’s singles final. …………Chen Meng maintained her rich vein of form; the winner in December at the Seamaster 2018 ITTF World Tour Grand Finals, the no.2 seed, she accounted for Zhu Yuling, the top seed, to arrest the women’s singles title (9-11, 11-7, 11-13, 13-11, 11-4, 11-5). …………Success for Chen Meng meant that the women’s singles title at an ITTF World Tour tournament in Hungary has never been retained; Hong Kong’s Tie Yana who won in 2010 and 2016 remains the only player to have succeeded on two occasions. …………It was lucky 13 for Chen Meng; that is the number of ITTF World Tour women’s singles finals in which she has now appeared. The record now reads 10 titles. For Zhu Yuling it was her 10th such appearance, the sixth time she has finished the runner up. …………Winning the vital points, it was the key for Lin Gaoyuan in the men’s singles against Wang Chuqin; four straight games but all close (13-11, 12-10, 11-8, 11-9). …………Victory for Lin Gaoyuan and another new name, eight editions of the tournament, it is eight different men’s singles winners. …………A second career appearance for both Lin Gaoyuan and Wang Chuqin in an ITTF World Tour men’s singles final. It is a second win for Lin Gaoyuan, he won in 2017 in Austria; for Wang Chuqin a second runners up spot, his only other final was last year when losing to Fan Zhendong.